Recently I came across a post on 6 Parenting Tricks That Children Into Geniuses, by David Wolfe. On reading the six tips, I starting thinking about how they were also great for adults to develop their own success genius. After all adults are just big kids – there’s a child in all of us, and we need to nurture that child to develop our own success genius. Doing so can help you to energise yourself for life and empower you to achieve your most important goals. 1. Encourage Your Child’s Independence. Let your child do things on their own that include trying and failing and trying again. 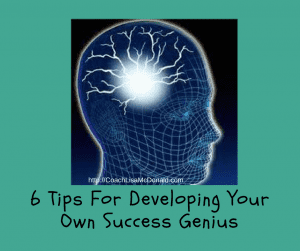 You can increase your own success genius by strengthening your independence. Your ability to be independent enables you to be authentic. It allows you to be your true self and to do what you truly value in life. Make sure you are doing things on a regular basis to nourish your mind, body and spirit. 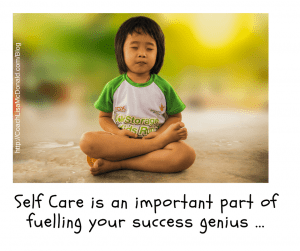 Self care is an important part of fueling your own success genius, and your ability to implement your goals. Allow yourself to keep trying and failing and trying again. Your own success genius needs the freedom to create and explore, so it can develop the knowledge and experience for success Keep taking action. Pick yourself up and dust yourself off when things don’t go the way you’d wanted them to. Accept that failure is a part of succeeding. And let go of the self-recrimination of getting it ‘wrong’. Re-setting yourself after each success and failure builds your resilience and strengthens your fitness for taking action, adapting and moving forward in life. Allow yourself to “make a mess”. Take away the need to get it right, or be perfect. Your own success genius is stifled when you try to too hard to get it right or be perfect. Instead, take the pressure off and give yourself permission to focus on creatively focusing on the task at hand rather than the exactness of delivering it. 3. Let your child play. If you constantly scold your child they will end up being afraid to do new things. Allow yourself time each day to be free of the need to focus on your productivity, getting things done and squeezing more out of the day. Too much of this will deplete your mental and physical energies, and will drain your ability to focus and fully utilise your own success genius. Allow time in your schedule for fun and freedom to be and to do things you love. It will boost your energy, focus and your own success genius. Remember too that scolding yourself can lower your confidence and self esteem. It can diminish your own success genius – reducing your belief in your abilities, eroding your self worth and leaving you feeling like you’re not good enough. Recognise where and when your negative self talk arises. Then reframe your thoughts. Affirm how what you’ve done IS supporting your ability to succeed at your goals. 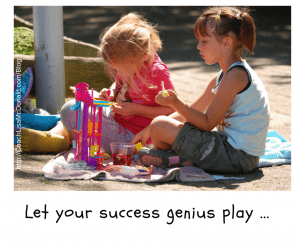 Let yourself play so that you own success genius can flourish. 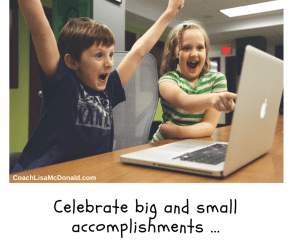 Celebrate your success and be proud of you. As you implement your goals, look for points of celebration – your own success genius thrives when you acknowledge it’s brilliance. Acknowledge small and large steps of your progress, including key mile stones. Honour yourself when you have failures as well; there’s always learnings and blessings to see when you really look. Rejoice when you break through old habits of thinking, feeling and acting – these shifts can be monumental in moving you forward. Take the time to pause, recognise and reward your own success genius’ efforts efforts. This is where focused goal setting comes in – your endeavours are your goals. And your own success genius needs to know where you want to direct your efforts and brilliance. It’s your opportunity to connect with the endeavours which are important, to articulate what you really want to achieve, and to establish clear outcomes that resonate with you. Research shows that writing your goals down increases your chances of success tenfold (link to blog …). Click here now to get my FREE Goal Setting Checklist and learn the essential the 8 key elements for setting goals. Once you have your goals written down, put them in a highly visual place to keep them top of mind. It will help to focus your own success genius and the relevant actions you need to take. Create an action plan which includes any personal development or supportive habits you need to implement. Then, take action and put your own success genius to work on helping your to achieve your goals! Self respect is an essential part of self love and nurturing your own success genius. 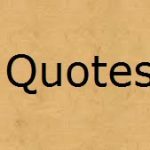 It comes from getting in touch with who you really are, knowing what you really want and taking action to live it out. Self respect requires you to be honest with yourself and others. It involves communicating your boundaries with others, and not settling for less than you deserve. If your self respect needs some work, address the underlying causes and make an effort to build your confidence. Bring out your own success genius and grow your ability to succeed, by nurturing the child within. Empower yourself by taking at least one action step towards your goals each day, and watch your own success genius grow.